Dave Liebman, tenor & soprano saxophones/C flute; Joe Lovano, tenor saxophone/autochrome/alto clarinet/Scottish flute; Phil Markowitz, piano; Ron McClure, bass; Billy Hart, drums. They open with “Locomotion,” from the ‘Blue Train’ Blue Note album that I used to own. Boy, did I love that album. “Locomotion” is propelled by an all-star rhythm section. Billy Hart’s drums are like a mix-master in cake batter, whirling the sweetness around at a relentless pace. Markowitz on piano leaps to the forefront, making extraordinary statements on piano and McClure on bass never waivers. His strong, solid foundation holds the rhythm together impeccably. 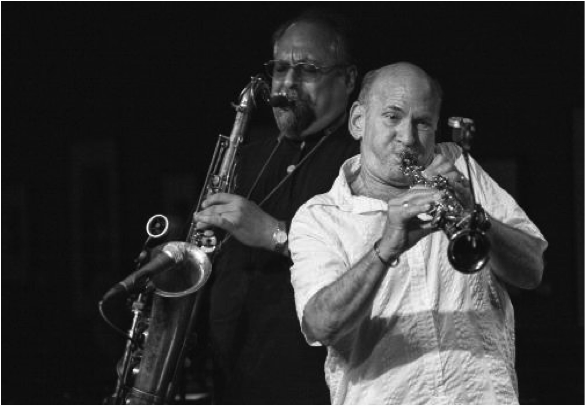 Liebman and Lovano blend horns, similar to the Coltrane arrangement, then each one ventures out on independent paths of improvisation. I enjoy their tribute to Coltrane, but I have to say I truly miss the Lee Morgan solo sound on trumpet and Curtis Fuller’s stellar contribution on trombone from the original recording. Never mind! These two iconic players bring their own spicy reeds to the mix. This album was recorded back on June 22, 2007 at the Clinton Recording Studios in New York City. The recording was made for a BBC Radio Program called “Jazz on 3.” It was a Somethin’ Else Production and recorded a decade ago to celebrate the 40th Anniversary of Coltrane’s transition. Half a century later, his music is still alive, well and relevant. Hart continued, “I was out in Los Angeles with Jimmy Smith, but I had the day off and I went to hear Coltrane’s band with Rashied Ali. The music was even a little advanced for me and when Coltrane got off at the end of the set. To my amazement, he walked over to my table. I was so excited. I can’t tell you. It was like my hero came and sat down. I never expected to have a conversation, but I said, John, your music is so advanced. What are you gonna do … about how people feel about your music? He said, you know, Billy, I don’t know what I’m gonna do, but I know I can’t stop. And that was like a rally to me. … I began to tear. I felt like I was going to follow this guy to the ends of the earth. So, I said, John, you’re really beautiful. And he said, I’m just trying to clean up. You can imagine if you didn’t take a bath for twenty years how dirty you would be. I’m just trying to clean up. You will find this CD a fine tribute piece to our great legend, John Coltrane. I enjoyed Ron McClure’s bass solo on the end of Olé. When he spoke about his love of John Coltrane, he remembered that ‘Blue Train’ album release in 1957. The one that greatly affected me. He was just sixteen years old and McClure says it changed his life. He said that album and Coltrane’s work with Miles Davis, from “Workin” to the “Kind of Blue” recording (another favorite of mine and millions of others), hooked him and helped to form a kind of concept of jazz for the young bassist. Phil Markowitz expressed his opinion of Coltrane by noting that like the legendary saxophone artist, he too was in search of beauty and expression in the music along with the constant exploration of the unknown.